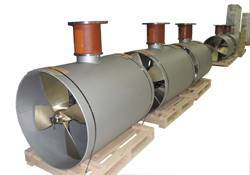 Six of WESMAR’s 180KW AC V2-34 (250) HP) Bow Thruster systems lined up for shipment were shipped for installation on Australian Ropax vessels to help maneuver around pilings and docks. WESMAR has shipped six of its large commercial bow thrusters for installation on three, 80-meter Ropax (Ro-Ro) vessels that will be working on a liquefied natural gas (LNG) project of historic proportion in Australia. The vessels are part of the Curtis Island LNG project and will be working off Gladstone near Curtis Island. The order is from Ultimate Marine Power, WESMAR’s dealer along the Australian East Coast. According to the Owner/Director of that company, Dave Murray, two each of the six WESMAR 180 KW AC V2-34 (250 HP) Bow Thruster systems will be installed on each Ropax vessel. Australia’s LNG project is huge and has been reported to be one of that country’s largest capital infrastructure projects. It involves dozens of communities, hundreds of businesses and thousands of people drawn from throughout the state, the rest of Australia and internationally. Australia’s energy industry is making multibillion-dollar investments aimed at supporting domestic consumers and pioneering the development of coal seam gas into liquefied natural gas. Included in the project is the building of a 540km buried natural gas pipeline network linking the gas fields to Gladstone and constructing a natural gas liquefaction plant on Curtis Island, near Gladstone, where the gas will be converted to LNG for export. “The WESMAR thrusters will offer extreme maneuverability, which is necessary for laying up against pilings and for aligning the bow door to the shore facility,” said Murray, who visited WESMAR last month to put his stamp of approval on the order. The boats, with thrusters installed, will be delivered to Australia during the first quarter of 2012. Murray’s company, located in Brisbane, sells to shipyards, commercial owners/operators, and naval architects and they supply specialized equipment and technical advice and support to their customers.